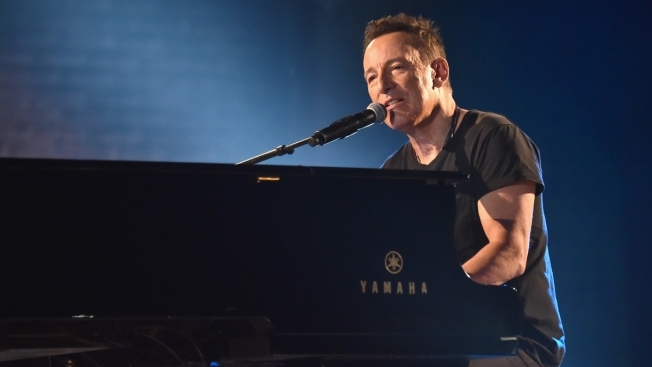 To director Thom Zimny, the key element in his filmed version of Bruce Springsteen's Broadway show was in the star's eyes. "I wanted to capture Bruce's eyes in a way that you don't get from being in the theater," he said. "It's another sense of intimacy, another sense of the performance." That focus paid off when cameras caught Springsteen's emotion during an introduction to the song "Long Walk Home," telling of an unexpected visit by his father just before Springsteen's first child was born. His dad said he hadn't been the best of fathers and hoped his son would do better. Anyone familiar with Springsteen's music knows the import of that acknowledgment. The filmmaker continually discussed the process with Springsteen and Landau. Their advice: "Plan a lot, but also be open to whatever the film gods or the music gods throw at you in the moment." There is no nervous backstage footage from before showtime, shots of Springsteen's hometown of Freehold, New Jersey, or artificial interludes, techniques Zimny dismissed as cliched. "I never felt interested in cutting away from the show," he said. "The power of the show unfolding was something I wanted to capture. There's no need for cameras or editing to take away from that moment. There was no need to cut to footage of Freehold or anything. The tree in my imagination was much more powerful than anything I could film." The tree was one Springsteen climbed as a boy in front of his house, that he later returned to as an older man. He's now 69. The theater audience is rarely seen, except at the film's end when Springsteen shakes some hands. "It was most important to capture a very abstract thing that goes on in the Broadway show — an emotional feeling and an arc where you go on a journey with Bruce," Zimny said. "It's hard to put into words. But experiencing the Broadway show is such a beautiful and intense presentation. I wanted the film to both represent that and also be slightly different — so if you saw the show on Broadway, you had a different understanding of the power of performance by seeing his eyes."